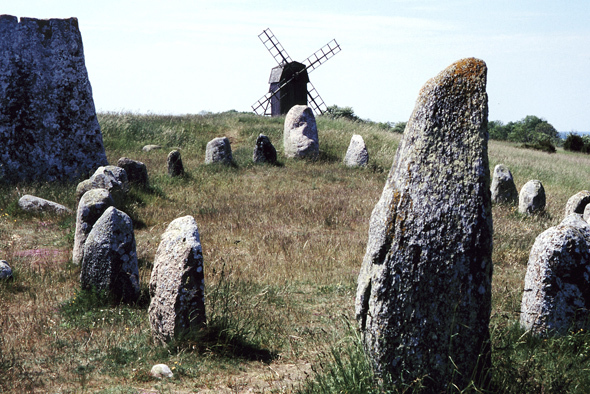 Öland, (pronounced err-lahnd) is an island off the southeastern coast of Sweden, a magical place that time, and for eleven months of the year, most of the world forgets. Iron Age and Viking people settled (or at least died a lot) there, and the island served as the Royal game preserve for centuries of kings. Nowadays it’s a folksy artist summer hideout, with huge parties at midsummer that go on for days. I first was on Öland—which translates to island-land, Swedes being rather literal like that–in 1991, and I fell in love with everything: the sea, the stones, the history, and the people. Everyone is beautiful in Sweden, from the craggy faced great grandmothers with laughing eyes, to brash boys that stare openly while not saying a word, and gorgeous women with the innate ability make really funky sweaters look fashionable. If you don’t believe me, have another shot of aquavit and tell me there isn’t something charismatic about that guy over there, the tall one who has been watching you all night and doesn’t look away when you meet his eyes. The sunlight is amazing in Sweden in June. All the clichés of the “land of the midnight sun” are true; it’s as if the sun is too excited to set, and doesn’t want to miss the festivities. I lost track of the hour when I was there, and the day, it was simply summer. A Midsummer Flight’s Dream is an homage to the island, and the airports that take us there and get us home.